A great way to while away an afternoon listening to Christmas tunes! Here are a few fun ideas for making biscuits. Choc tip: If you want chocolate biscuits, just replace 45g of the flour with cocoa powder! Cream together the butter, sugar and vanilla paste until light and creamy. Slowly beat in the egg until fully incorporated. Add the plain flour and mix on a slow speed until begins to form a ball. Remove from the mixer, shape into a ball, wrap in greaseproof paper or cling film and refrigerate for at least an hour or for best results overnight. Preheat the oven to 180°C, dust work surface with flour to prevent the dough sticking. Knead the dough a little then roll out til 5mm thick, then cut out biscuits and place on baking tray lined with greaseproof paper. Bake for 10-12 minutes or until light brown. Leave to cool on tray for 5 minutes to firm up before moving to a cooling rack. 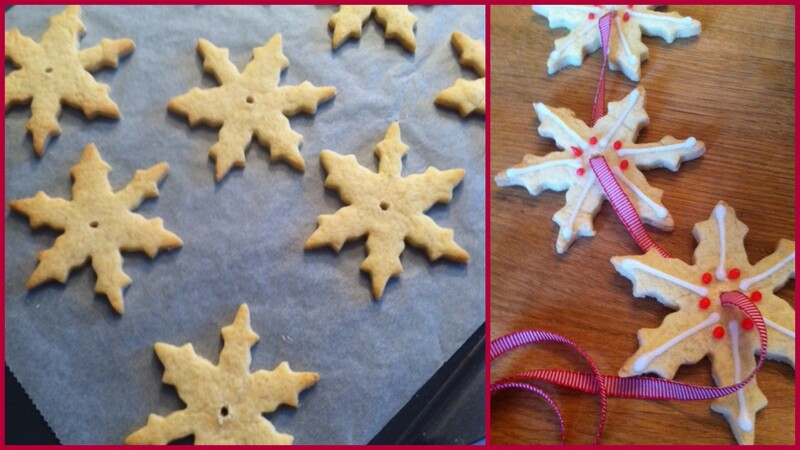 Tip: If you want to make the garland snowflakes, then make the holes using a skewer as soon as the biscuits come out of the oven. 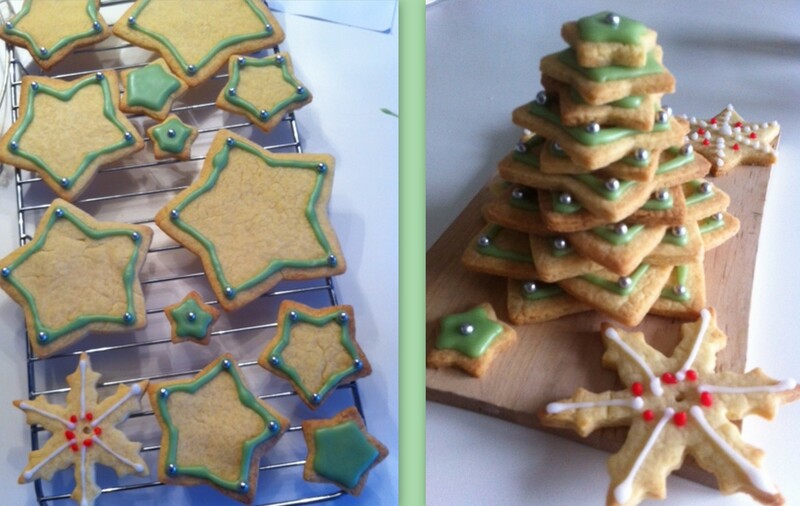 To decorate, mix icing sugar with teaspoons of cold water until you get the right consistency. I use gel food colouring as it doesn’t thin the icing, so remember if you are using liquid colouring this will thin the icing further and you may have to add a bit more icing sugar. You can also dip your biscuits in melted chocolate, rather than icing. You can get great cutters from all the big supermarkets; you can decorate tree shape biscuits, Christmas stockings, reindeers with red noses etc. And of course you can make several varieties of biscuits if you have the time. 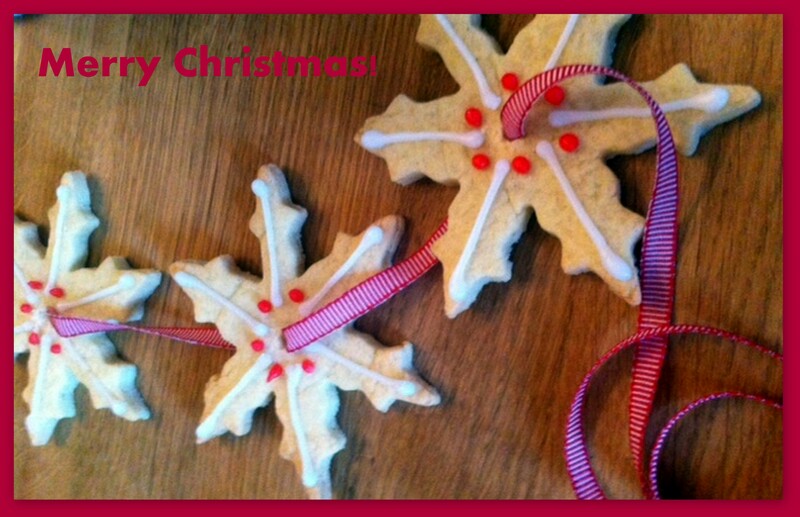 Send us your photos of your Christmas biscuits!